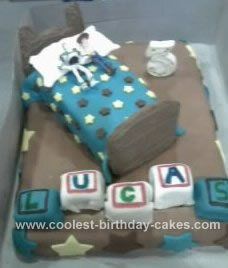 I got the inspiration for this Toy Story Birthday Cake Design from this website. I used a recipe for chocolate cake for the bottom layer(11″ by 15″) “Andy’s bedroom floor”. I used a recipe for white cake for the top layer (bread pan) “Andy’s bed”. Both the bottom and top layer had buttercream icing then topped with marshmallow fondant. The headboard and footboard was made with sugar cookie dough rolled out and cut. I baked the sugar dough for a few extra minutes so it wouldn’t be pliable. I then iced the both with buttercream icing. The pillow was made out of fondant with marshmallows as the stuffing. I cut blocks out of a cake and covered them with fondant and wrote on them with a food decorating pen. All stars were cut using fondant star cutter.